The small efforts we make now in the garden will still have plenty of time to grow before autumn sets in, in Virginia. We still have at least ten weeks, probably more in most parts of the state, to enjoy our gardens. It amazes me, sometimes, how quickly plants grow when the conditions are right for them. This little pot grows in the shade of our Azalea hedge, beside the driveway. Ferns love these sheltered, shady spots. 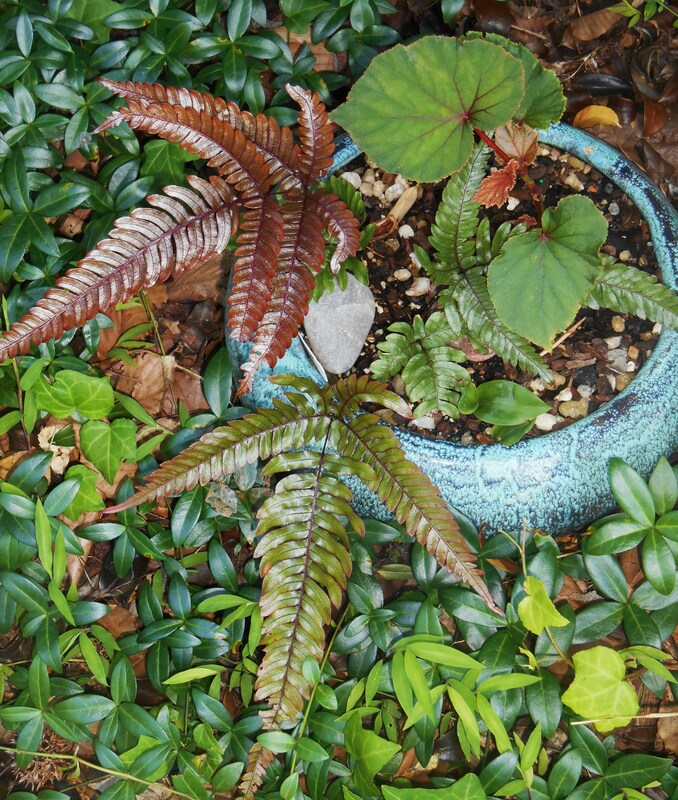 I planted this Cretan brake fern from a 1″ nursery pot early in June. Now it has settled in and given beautiful new leaves. I added the hardy Begonia division about two weeks ago now. There was a stand of them elsewhere, which needed thinning. I dug up about a dozen babies and spread them around to see where they will take off and grow. 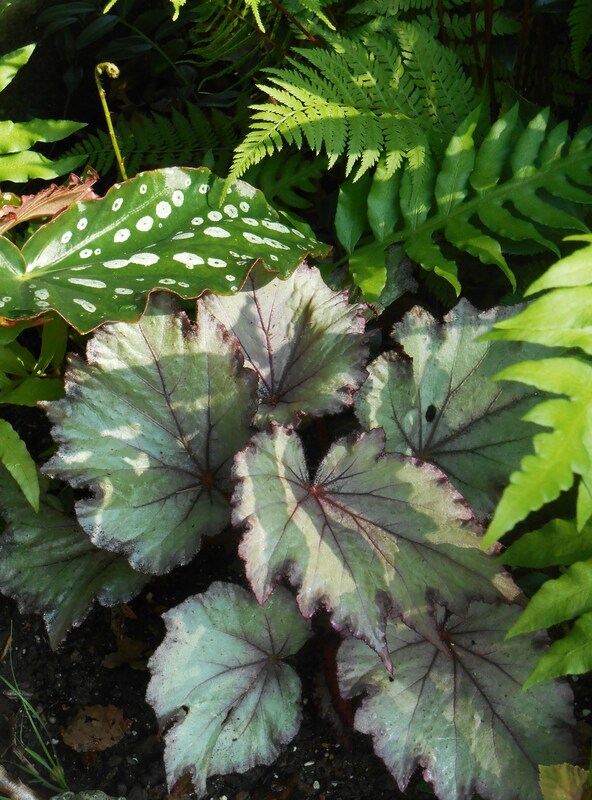 Hardy Begonias also grow quickly once they find the right spot and dig in their roots. I hope to show you this one in bloom by early August. It will grow to at least 12″ tall by then. 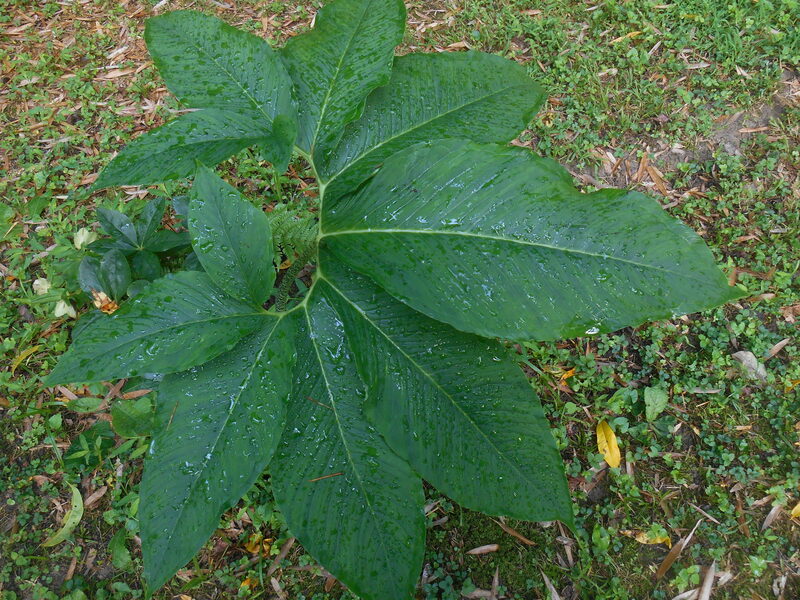 Even better, it will form a little bud at each leaf joint which can grow into a new plant next season. The new leaf in front is from a rhizome left in the pot from another season, just now showing its first leaf. We’ll see what it has in store for us this year. Whatever early summer held for you, please keep your optimism and keep planting. Whether you sow a fresh crop of seeds for fall vegetables, or whether you adopt some of the late season offerings at your local nursery, there is still time to make small beginnings and watch them grow into something beautiful this season. All you truly need is the desire, a vision, and a small pot of good soil to get started. Here is my magical Begonia, which dies back to its rhizome from time to time. 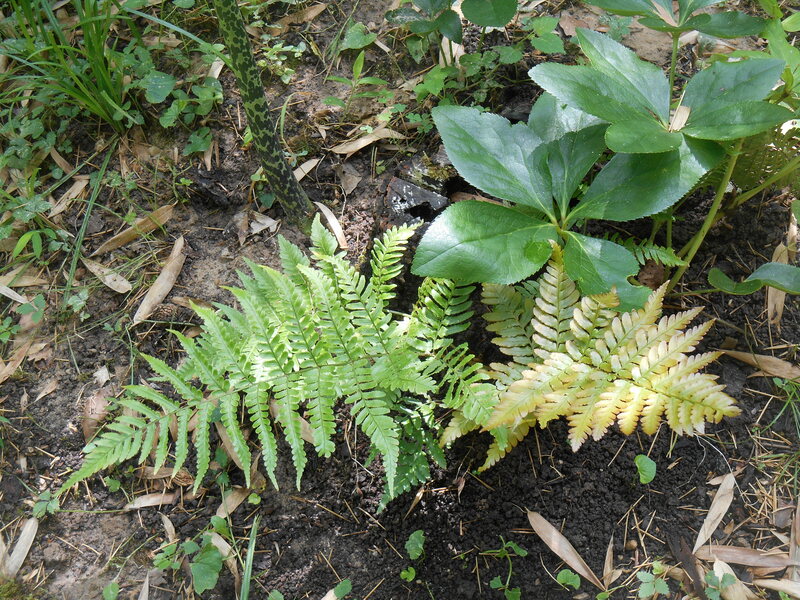 From its sad start when I set it out in May, it has now grown its summer crop of new leaves in a shady bed of ferns. This is one of our small ‘stump gardens.’ We’ve planted a seedling Hellebore, an Autumn Brilliance fern, and a Voodoo Lily in compost around the stump of a fruit tree lost to a storm. Each season we add a little compost as this tiny shade garden expands. The same stump garden, from a different perspective…. You made me realize that we are at midsummer already (wah!) so your reminder not to squander our days is timely! That should be a stunning combination, Eliza! I’m glad you gave them all root room; they must be so much happier now! Did you get the white polka dot plant, or the pink? Pink polka dot and pink wax begonia with burgundy foliage. Hope they flourish in their new root-space. I have them on the front porch on the table next to our chairs. Today was our first really warm day, dry thankfully, but the sun was so intense! I think it was Robin who mentioned in a post how intense the heat was. Makes me wonder about solar activity and our atmosphere? Could there be change afoot or was it the lack of humidity? One can only guess. Big hugs back at ya! How pretty that combo must look on your porch! Photos coming ? Our gravitational field is reportedly letting in more solar radiation these days , and the sun feels so brutal , unlike it ever felt in my youth. We hate to go outside mid-day unless it is cloudy . You have a lack of humidity ? 100% here today 😐 Do you follow Gwen nest Garden ? She shows her plants burned by the sun in Brussels . ..
Oh, my, I wondered if something was afoot. Yes, dry here as we get air down from Canada. When it is southerly we get the humidity. I looked at Gwen’s post – really disturbing. I’ve never seen plants burn like that in summer. Reminds me of winter kill here. The planet is screaming – is anyone listening? Sigh. I really wonder if we are getting exposed to greater radiation than we normally do. It certainly FEELS different to me. Wonder if NASA or NOAA have any reports on it? Who would tell us? I will answer with email , Eliza…. It’s easy to let our enthusiasm flag in the heat of summer. These words of encouragement could not be better timed. Oh! I love your little stump garden. I might have to start one of those. Our local nursery has a lot of things on sale now, most looking in need of a good home. I’m thinking of adding a few new things to my garden soon. Wonderful quotes and I enjoyed your new little plantings too. I think renewal and the cycle of life are so very much part of our gardening lives.